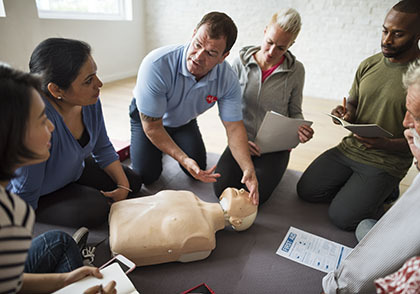 Emergency First Response® CPR and First Aid Instructor Training Courses offer you a unique opportunity to teach and certify student-level international certifications. EFR Instructors have a superior facility to tap into a variety of limitless markets that require or request CPR, AED, First Aid, and Childcare, while supplementing your income at the same time. Potential companies that must provide employee CPR and First Aid training due to governmental or local regulations. During the Emergency First Response CPR and First Aid Training Instructor two day course, you will build on your skills as an Emergency First Responder through a multi-media approach of independent study, classroom sessions and practical teaching assignments, and focus on developing your instructional abilities to teach these skills to others. The instructor course covers specific goals and performance requirements for the Primary Care, Secondary Care, Care for Children, and AED courses, along with instruction on how to structure learning, the requirements of performance-based training, and your role as the instructor in the learning environment. The flexible two-day instructor course syllabus also teaches you how to motivate course participants, evaluate student knowledge, present course content effectively, become proficient in developing hands-on skills practice sessions, and how to present an effective scenario-based learning experience. To enroll in the Emergency First Response Instructor course, you must be at least 18 years old and have completed CPR & first aid training in the past 24 months, or be a practicing medical professional such as a physician, Emergency Medical Technician (EMT), Paramedic, or Registered Nurse. More information is available in the Instructor Course FAQ section. Individuals who are currently a CPR and First Aid instructor with another qualifying organisation may choose to earn the rating by completing the Emergency First Response Instructor Crossover course. This course gives credit for past teaching experience and focuses on familiarizing candidates with the Emergency First Response course philosophy and structure. EFR Online Instructor Refresher programs are used to upgrade EFR Instructors in non-teaching status to teaching status or as a refresher if you have not taught any courses recently. Now, there is also a more convenient way to become an Emergency First Response Instructor Trainer. You can complete the knowledge development portion of the course independently online if you prefer. The Emergency First Response Instructor Course provides qualified individuals with the additional training necessary to teach the Emergency First Response Primary Care (CPR), Secondary Care (First Aid), Automated External Defibrillator and Care for Children courses. This course builds on the instructor candidates’ skills as primary and secondary care providers and focuses on developing their instructional abilities. Through independent study, classroom sessions and practice teaching assignments, instructor candidates learn how to market and conduct the Emergency First Response programs. Those with current CPR First Aid Training course instructor credentials from other organizations may take the Emergency First Response Instructor Crossover Program. Practicing medical professionals (e.g. paramedics, EMT's, nurses, doctors) are not normally required to have completed the Emergency First Response Primary Care (CPR) and Secondary Care (First Aid) courses. Although participating in these provider-level courses is beneficial, it is not required since professional medical training serves as an equivalent. Instructor candidates should complete the four self study knowledge reviews before the course which are found in the EFR Instructor Manual and Primary Care Student Manual. Attend and complete student-level training for the programs you wish to teach. This provides you with an understanding of the course content and the physical skills. If you currently possess these skills you have already completed step one. Complete our instructor self-study system to learn about EFR instructional design and class administration. We have condensed this traditional classroom-based information into a self-paced resource, so you can study anytime, anywhere. Attend and successfully complete a classroom instructor development course. This is designed to help new instructors become skilled in presenting the instructional elements found in EFR training programs. This includes real-time demonstrations, small group practices, talk-through scenarios and performance evaluations. An instructor candidate must have a classroom training session monitored and participate in a practicum. An actual student-level class is to be delivered by the instructor candidates while the EFR IT overseas the course. After satisfactorily completing all performance requirements, an instructor candidate applies to become an Emergency First Response Instructor (which also includes authorization to conduct the Care for Children course) by submitting an Emergency First Response Instructor application to your Emergency First Response Office. Along with the application, instructor candidates need to enclose a photo and processing fee. *Note: The price includes a free instructor starter pack but not the additional membership renewal fee of approximately AU$100 per year which must be paid directly to Emergency First Response to gain and retain teaching status allowing you to certify students through EFR®.